People watching the rapids at Kalagala falls. Kalagala is certainly going to be a different place in a year's time. 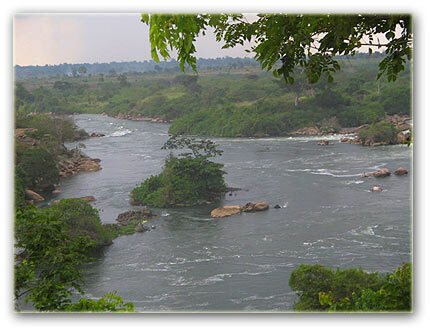 During the debates on whether or not to construct a power dam at Bujagali near the source of River Nile in Jinja, some conservationists suggested that government should instead go ahead and build a dam at Kalagala Falls in order to conserve the beauty and nature at Bujagali, famous for its rapids and water rafting. But some people, including the World Bank, insisted that Kalagala was even more naturally endowed and beautiful than Bujagali- only that Bujagali was more popular. The government will finally build the dam at Bujagali, by all means according to President Museveni, for his government to produce more hydro power. Even if we are not in a battle of opinions on which place should have been spared (after all more power can only be produced at Bujagali than at Kalagala), many people might agree that conserving the natural endowments at Kalagala is paramount for. This is something you only undertand after visiting Kalagala, which is found in Kangulumira, in Kayunga district, about 99km from Uganda's capital Kampala. It is a place many Ugandans have heard little about, but it contains one of Uganda's natural wonders and attractions that bring people to this rarely mentioned district. I had to make a number of phone calls before I could get the right directions to Kangulumira, a place I found hard to mention properly or remember, but thanks to the pen, I was able to ask for the right place when I went to the old taxi park in Kampala. 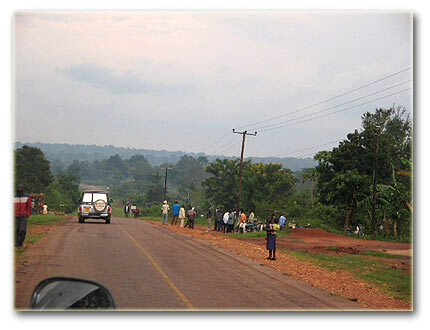 It was an enjoyable afternoon drive, especially given the fact that the road is tarmac and in good condition, whether you pass through the branch off at Mukono, or you pass through Gayaza road that continues staight to Kangulimira. Here, for one thousand shillings I got a boda boda for that took me to Kalagala where a revelalation awaited me. What less would I expect with the flowers from trees and crops smiling at us all the way as we traveled through the mostly flat Kayunga. It seems a blossoming season for the people of Kalagala and Kayunga. Not just in the flowering and grown cassava, potatoes, coffee, sugarcane, maize, bananas, and beans that people here evidently grow in large numbers, but at the virtual revelation that seemed to hover over Kayunga today. Welcoming the Kabaka to Kalagala for the launch ceremony. 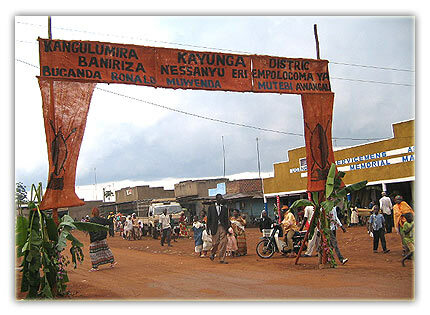 This Saturday, the road is decorated with bananas, reeds and flowers to welcome the Kabaka of Buganda, Ronald Mutebi II who was launching Kalagala as a cultural and tourist centre for Buganda kingdom. Thousands of people were parading the road at 3 pm when I arrived. When I arived at Kalagala, the first thing to catch my attention was the big numbers of people standing next to the waters, despite the fact that a ceremony was going on at the flat surface where the boda boda had dropped me. The Nile river at Kalagala in kayunga district. Then I glimpsed at the flowing waters from two different rivers, the forests, stones and small islands in a water body you may call a small lake. Soon I was moving about like a mad person crisscrossing people to get a good view of the waters whose whooping sound had caught my attentiion as I came in from Kangulumira. No wonder people were standing, gathered in amazement. The waters were magficiently rolling from the luminous falls downstream before relaxing in the small lake where I could see scores of people ridding in boats. I was told this was for fishing or leisure. 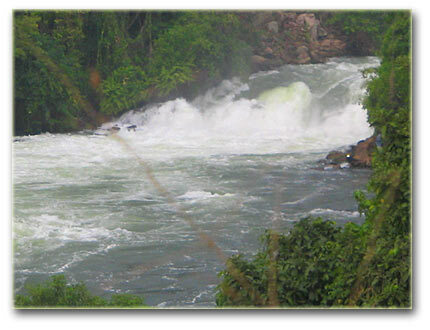 From the upper side at Kalagala, one can clearly see the Nile forms into two channels both with rapids sparkling like hot boiling water. If you are here for the the first time, it is easy to think this is a lake. 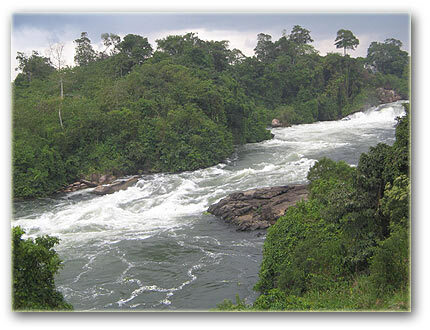 After drifting from the rapids, the water of the great River Nile cascade into a lake-like sanctuary that apart from being a fascinating site to see, also houses the Kalagala cultural caves where many Buganda guardian spirits reside. 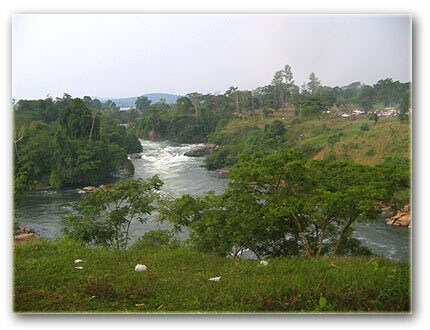 It is from here that the Nile flows into Lake Kyoga, which I was told is about 20 kms away, after passing through the famous Sezibwa falls. One of the people enjoying the view, who refused to tell me his name, says they have come to see what the Kabaka wants to claim back from Bazungu who bought the island between the two River Nile tributaries at Kalagala from government. As he pointed at the forested islands where only a small red colored tent or hut could be made out from a distance, I convinced myself that I would buy it too if I had the money. According to Musawo Musa Salongo, the caretaker of the Kalagala caves of Baganda guardian spirits, the forests at Kalagala contain an array of wildlife that the Kabaka wants his subjects to help gather, maintain and use them to attract tourists to the already physically endowed Kalagala where locals and the kingdom can earn an income from what they believe God gave them here at Kalagala. I was saddened that despite this fascinating natural environment, no hotels, or service centers exists in this area. No restaurant, no leisure joint. Actually, on the visible sides of the small lake formation, one can see clearly that the major activity near the waters and the forests is farming, as harvested gardens circle the lake to almost the water points. 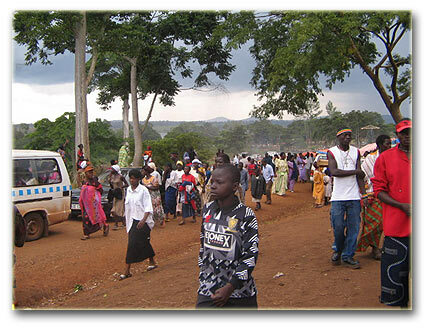 Kalagala is a virgin tourism territory in more ways than one. I did not even see any hotels at Kangulumira trading centre to take advantage of this natural endowment at Kalagala. It is then that I understood the Buganda kingdom's hurry to declare the area a tourist ad cultural centre, amid allegations that the Bazungu had acquired parts of the area to explore and build tourist camps and put up a game reserve of sorts. Whether they work together or not, Kalagala is certainly going to be a different place in a year's time, as locals, the Buganda kingdom and foreign investors realize with haste that Kalagala can offer much more than the natural beauty in their daily lives.